Cheers! It’s 2015, and we at Hunt and Gather Home are looking forward to what lies ahead in the new year. The last few months of 2014 were busy with our regular jobs, family, and the comings and goings of everyday life. Throw in a few design projects and that makes for two busy Mamas with little time to blog! So, before we move on to the hope and excitement of the nascent year, we want to share with you a super fun holiday project that really capped off our 2014. Last summer, my (Megan’s) mother asked us to help with the design of her screen porch enclosure on her nearly 100 year old home. The porch, a 1930s addition, needed to be raised off the ground due to the roots of a large Magnolia tree nearby that were making the marble slab floor unlevel. My mom decided she would also like to enclose the porch to provide additional living space for large family gatherings. To sweeten the deal, we’d also get to help decorate the newly enclosed porch for the neighborhood’s Holiday Tour of Homes. 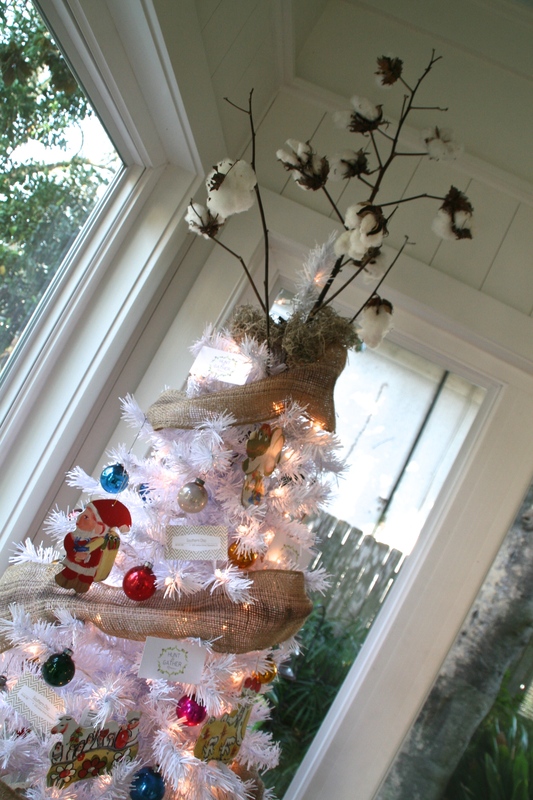 We jumped at the opportunity – who doesn’t love a southern porch and Christmastime in the South? 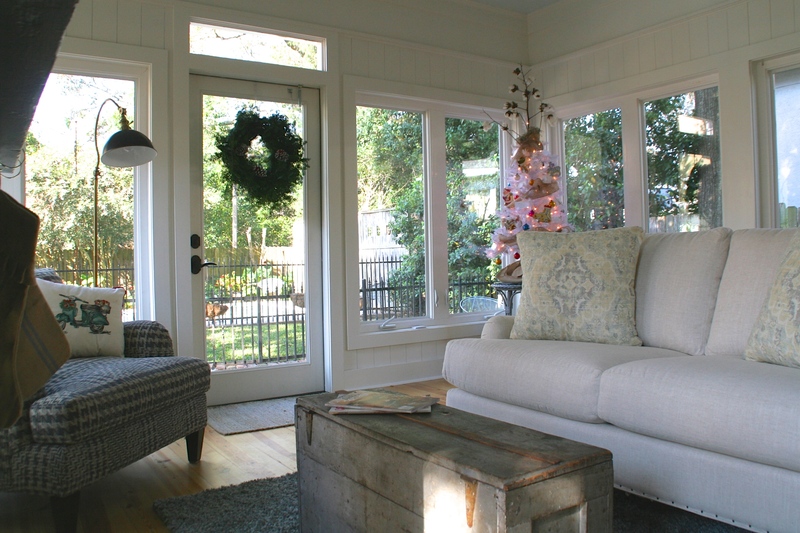 The structural work on the porch was finished in mid-October, but we began working long before by scouting out the perfect finds to transform this dingy back porch to a cozy, comfortable family room. Though the idea of a screened-porch in Louisiana was quite lovely, the reality was that the screen trapped dust from the yard, mixed with the summer heat and incorrigible year-round humidity, and created a space that no one could enjoy, save for a few rescue kitties. Seeking a way to continue to enjoy the beautiful courtyard environment and retain the feel of a porch, wall-to-wall windows were installed on three elevations. A gas-burning fireplace was installed on the center left wall to evoke the sense of family and gathering. 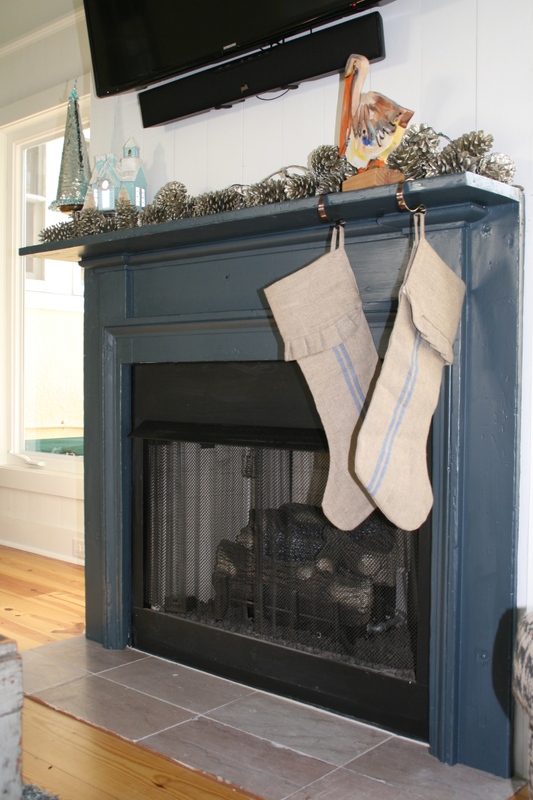 We scouted out several antique salvage mantels at Snow’s Antiques, and finally decided upon this beauty, which we trimmed up to fit the space perfectly and then painted Narragansett Blue. The walls are wide vertical wood planks painted white. During painting the joints were scraped clear of paint with an expired credit card to create a coastal/cottage/camp vibe. 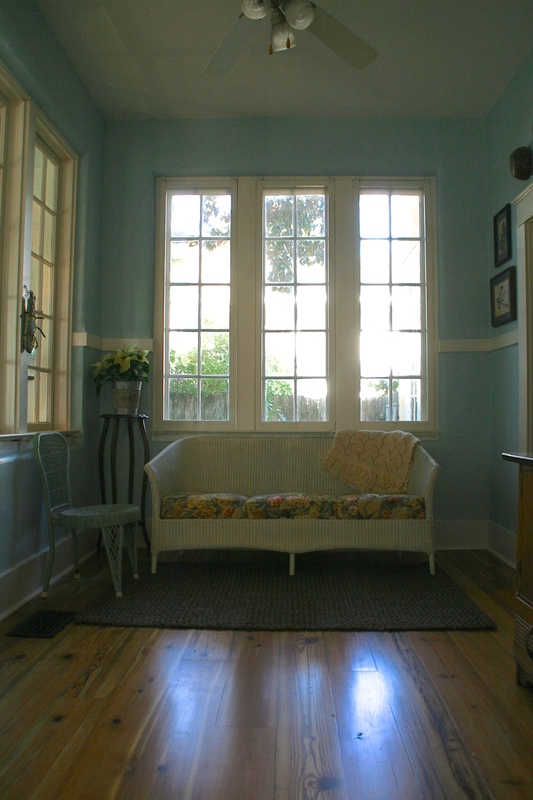 The beadboard ceiling is original and required only a good cleaning and a touch-up of the Haint Blue paint. And those floors. We couldn’t have dreamed up anything more perfect. After looking into several flooring options – herringbone wood-look ceramic tile, “new” wood flooring stained to match, painted wood flooring, and reclaimed heart-pine laid on a diagonal – my mom finally choose the reclaimed pine. At the last minute, she chose NOT to lay it on the diagonal for fear the room would be too busy. 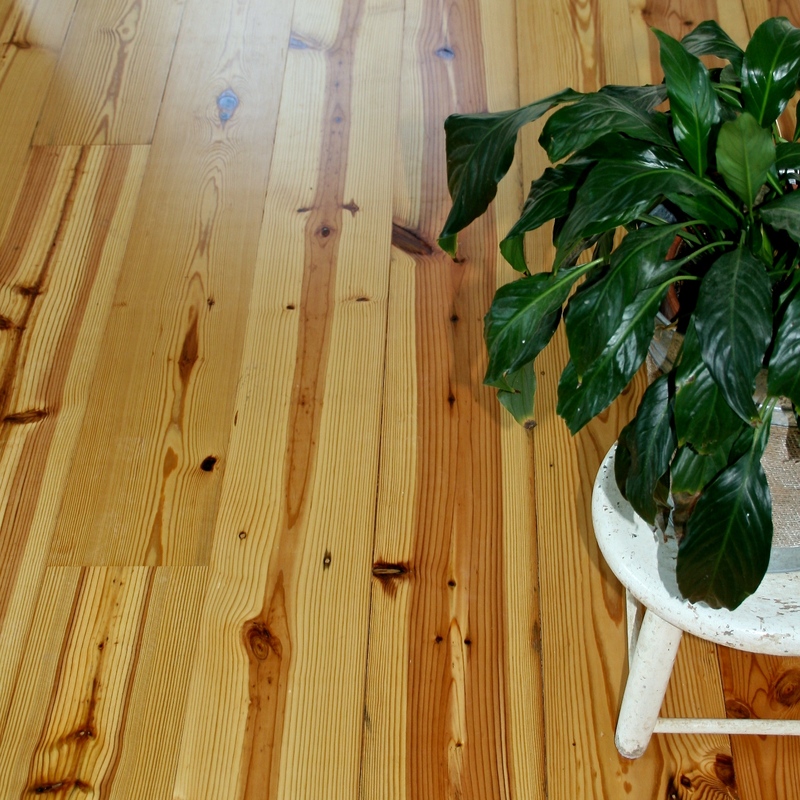 The wood was not stained, but its natural color merely enhanced by a sealer. What can we say? Lovely choice, Mom! The floors really are a breathtaking feature of the room, but my absolute favorite feature is the salvaged cypress French doors Mama and I found at the Washington Antique Mall during the fall antique fair weekend. The patterned glass matched the glass in an existing interior door in the house, and the patina of chipped paint in just the right colors to match the kitchen and fireplace mantel was too perfect to pass up. At $200 for the pair, only a slight shaving down to fit the existing door frame, and a quick cleaning with a damp cloth, these beauties will make you choose salvage material over new any day. With the walls, floors, and ceiling finished, we switched our focus to staging the room. My mom wanted to pull in existing furniture from around the house and a bring a few antique pieces from storage before shopping for anything new. We moved the small, round kitchen table out of the cramped breakfast room and into the new space. In its place in the breakfast room we placed a freshly (spray)painted and recovered antique wicker settee to provide seating without bulk. 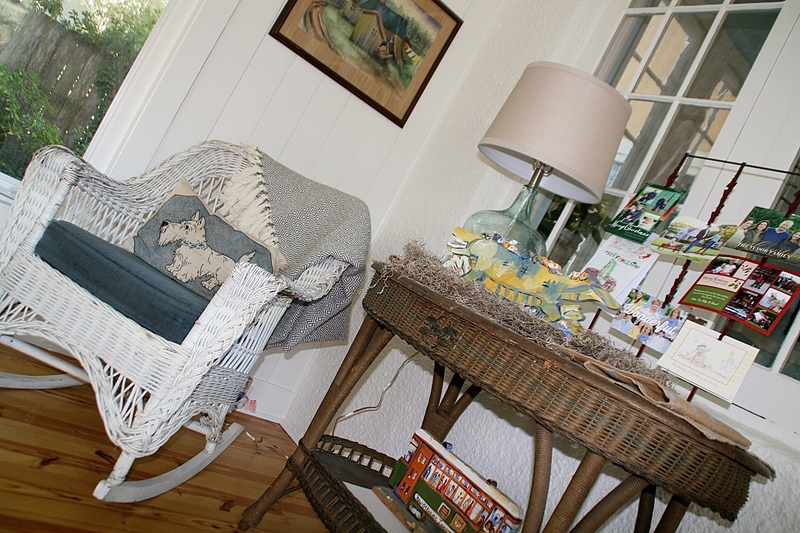 Three other antique wicker pieces were moved from storage to the new family room: an oval console table, a round side table, and a wicker rocker. Placed about the room, they enhance the back porch feel of the space. When it was finally time to shop for a new couch, chair, and rug, we decided to pull in some modern elements. The linen couch is super plush, yet stylish with its curved and rounded arms and nail head trim (don’t worry – we used Scotchguard). The oversized grey flannel chair is one of my favorite finds. The fabric and plaid/houndstooth pattern suggest mid-century style, while the shape, size, and feet are completely modern. The rug was a Target find – fun, yet practical for a piece that’s sure to get plenty of wear and tear. All decorative elements in the room were pulled from other places in the house or from storage. The best place to shop is usually your own house! 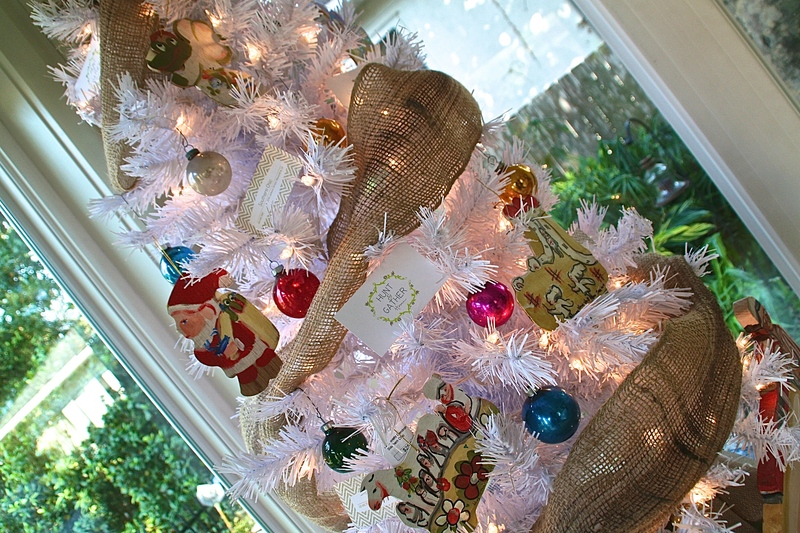 We had fun grouping my mom’s collection of Louisiana artist Lorraine Gendron’s painted wood cutouts in the room and even borrowed a few of her Christmas ornaments from one of our favorite local shops, Southern Chic, to decorate the tree. We had a fabulous time with this project and, from personal experience, I can tell you that the family thinks it is fabulous, too! My two boys LOVE the “new porch” just as much as the rest of us. It’s the first place we all go when we stop by to visit or share Sunday lunch. It’s funny how enclosing a room can actually make a space feel more open and people more connected. This finished room exceeds all my expectations! I could never have done it without the expert help of my talented daughter ,Megan ! 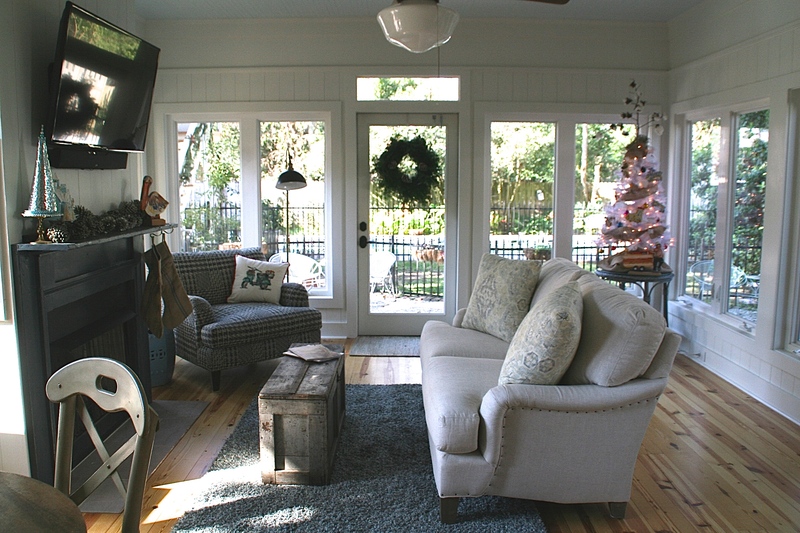 It was such fun to see your vision for a family room/porch realized in such a lovely way. 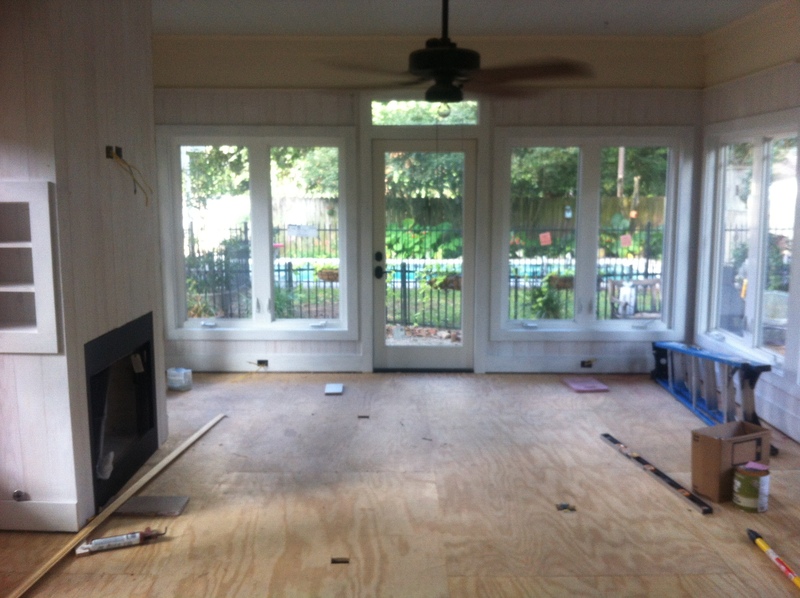 I now have the best of both worlds, a cozy sunroom and plenty of room for family gatherings! Kudos to Megan! We’re so glad you love it! Thanks for choosing us to for such a fun project! 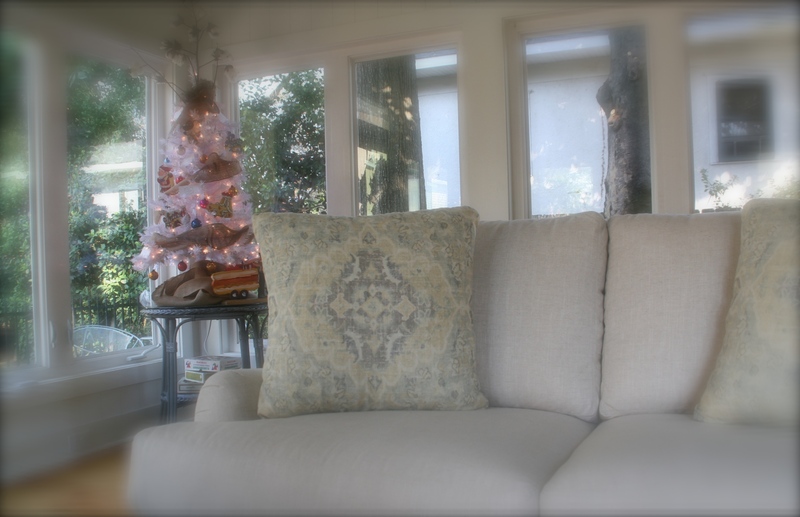 I was one of the lucky ones who was able to tour your enclosed sunroom on the holiday tour. You did an excellent job! I loved the whole house! However, the addition blended perfectly with the rest of the home. Thanks for opening your home to all of us. Thanks for taking the time to tell us how much you enjoyed it, Connie! And we agree – the whole house is lovely. Glad you were able to take the tour! Absolutely beautiful! Wonderful finds and perfect inclusion of existing pieces. Expertly done all the way around. Bravo! Kudos to all involved.